Shadows of Brimstone: Forbidden Fortress is a dungeon crawl adventure game, which belongs to the Shadows of Brimstone series. You play as great Heroes who fight against evil creatures and demons that have overrun the Forbidden Fortress in Feudal Japan. It is a fully cooperative game where all players work together against the game itself. You can choose to be the Samurai Warrior using your mastery of the Katana, the deadly ninja Assassin using stealth and speed, the Traveling Monk that is a member of an ancient Yamabushi or the powerful Sorceress, who wields Elemental Magik. The creatures that have invaded the feudal castle are Demons, Ghosts and Monsters that have been inspired by the Japanese myth and legend. However, the greatest foes are hidden inside the fortress: the Harionago, a ghostly demonic woman who slashes her enemies with the vicious barbs of her hair and the Living Statue, which has been possessed by Darkness. 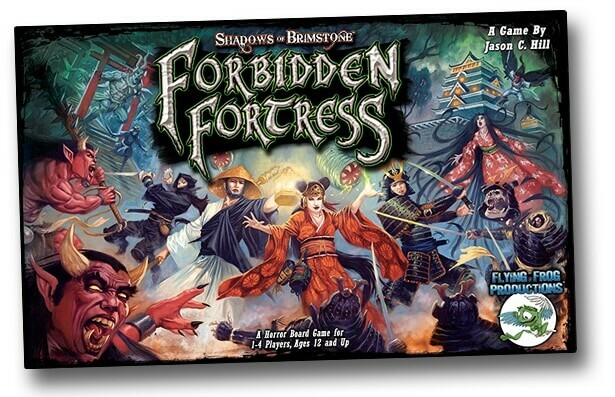 Shadows of Brimstone: Forbidden Fortress can be played as a standalone game or it can be combined with any other product of the Shadows of Brimstone series. It features some beautifully detailed miniatures for both the Heroes and the Enemies, which are perfect for painting. You can use the Shadows of Brimstone Game Engine for immersive adventures and a story-driven gameplay, while there are 12 different Missions and a built-in campaign system through which your characters can evolve from game to game, by gaining new skills and items as they go up in level. The game also includes double-sided Map Tiles with a Forbidden Fortress of Feudal Japan on one side and the Belly of the Beast Otherworld on the back side of the Heroes to explore. This allows them to step through a shimmering portal and continue their adventures in an alien world inside of a massive living creature. Finally, the game features a CD Soundtrack of original music, created in order to set the right atmosphere while playing. Shadows of Brimstone: Forbidden Fortress has been up on Kickstarter where it has exceeded its funding goal by far and it is due for release in 2017.